Here is another card project that I recently completed. I was not happy with the quality of the photographs- the color depth, crispness and clarity did not accurately display the pictures. (I am not a great photographer by any means). The pictures were slightly enhanced using Picnik and the "after" picture is much closer to how the card looks in person. This was such a fun card to create. A variety of materials were used and the end result was a wonderful, whimsical shabby chic creation! 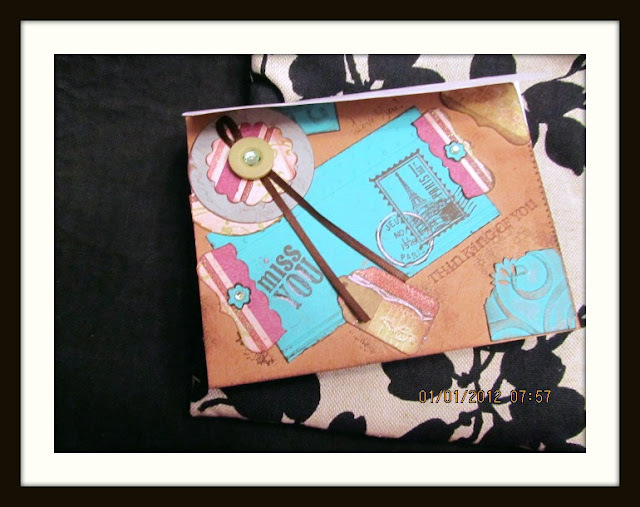 This card was created on an ecru card base - Kraft Paper was pasted over the front of the card, essentially creating a new base. Turquoise card stock was embossed using a Sizzix folder that came with the Texture Boutique machine kit (swirls and Swiss dots). and cut a rectangle, corner piece and small square. A corner punch was used on the corner section. All pieces were lightly and gently stamped over with a gold stamp. For the next step, simple shapes were cut from metallic Christmas paper and a lighter shade of craft paper with a punch and also with scissors; these were distressed with a dark brown stamp and gold stamp, both on the front and the edges until achieving the desired effect. The card stock shapes were arranged and pasted on the card stock. The turquoise card stock was stamped with brown ink and a Parisian postal stamp. Small sentiments were also stamped and handwritten with brown ink and highlighted with a rose colored gel pen. Flower shapes using a mini punch on the turquoise craft stock, distressed at the edges, pasted on the "photo holder" embellishments and adorned with mini rhinestones. A flower was decorated with brown ribbon, an avocado green button and a mint colored rhinestone. The inside of the card was covered at the top and bottom sections with turquoise scrapbook paper; this was then overlapped with slightly distressed Kraft paper centered at the middle of the card. This provides ample room for writing a meaningful note. The back of the card was treated as a canvas of sorts - it was stamped using what I call a tattoo stippling technique - basically stamp multiple images are stamped, overlapping one another to where only some parts of the images are clear. On a different section a clear image is stamped. For a final step, various sections of the card are colored in with gel pens and embellished with rhinestones. For fun I did go slightly overboard in Picnik on this one using the HDRish enhancement (I love the funkiness of the after picture). In person the colors are more muted and the tattooing is less crisp - very much in between the two shown below. You can get a good idea of the overall effect from the pictures below though. I look forward to sharing more projects. I have been experimenting with raised embellishments to add a little more dimension as well as using different embossing and stamping techniques. I would love feedback - please free to comment or post links to your paper crafting projects. What a fun way to share your birthday greetings for a friend - the recipient is sure to love the special touch of a handmade card! -The base for this project was an olive and white plain, blank note card. This was purchased at Michael's craft store for $1 a pack. Michael's is a great source for inexpensive blank card sets. - The front was partially covered with an embossed rectangle of light gold cardstock - this was created using the Sizzix Texture Boutique Embossing Machine with a swirl and Swiss dot embossing folder included within the package. - The edges of the embossed cardstock were "aged" with a light application of a gold art marker. This shows up a little more stark on film - in person the actual effect is much more muted. - For a debossed effect, the embossed side was adhered to the card face down using craft glue stick. - Embellishments added were a Cricut bird (Straight from the Nest cartridge I believe) and a flower created using a punched black cardstock circle and black patterned foiled cardstock flower. The flower was adorned with a layered "3-D" foil and cardstock butterfly sticker). The bird was adorned with a sea foam green rhinestone eye. - The olive sections at the sides not covered with cardstock was given a decorative border in black ink using a clear acrylic block and ornate border stamp. - The stamped image was distressed by lightly sponging over the image with a stamp pad and the brushed in a cross hatch style using a "dry" ink wash (black ink semi-dried on dry paintbrush). Once fully dry this was lightly sanded for an aged finished. This same technique was used on the Swiss dot section at the bottom of the card. - "Happy Birthday" rub-on lettering that was included in the Sizzix Texture Boutique kit was added. - 2 identically sized gold squares were glued to the inside left and right panels of the card. - The squares were given an aged patina by using the distressing technique outlined above repetitively (black and brown stamp pads, inkwash and sandpaper). This was done until finish desired was achieved. - The white border around the cardstock was painted with a heavy, black wet ink wash, blended with the cardstock and set out to dry. - The left side of the card was adorned with a piece of black cardstock with intricate "lace" decorative shaping at all 4 corners using a Fiskars corner punch. The black square was embellished with a flower created using a circle punch on black print card stock with a foiled / shiny finish. The Cricut flower cutout was aged using the distressing techniques outlined earlier. - A vellum "quotes" overlay was added. Because the vellum is translucent, the glue dots used to adhere to the card were slightly visible through the paper; these dots were covered using larger sea-foam green rhinestones. There is quite a bit of dimension on both the front and on the inside of the card. The gold against the olive, black and brown gives a great pop of color. The distressed finish gives a great rustic, vintage feel but the bird, foil and rhinestones add a touch of contrasting glitz for a great combo.